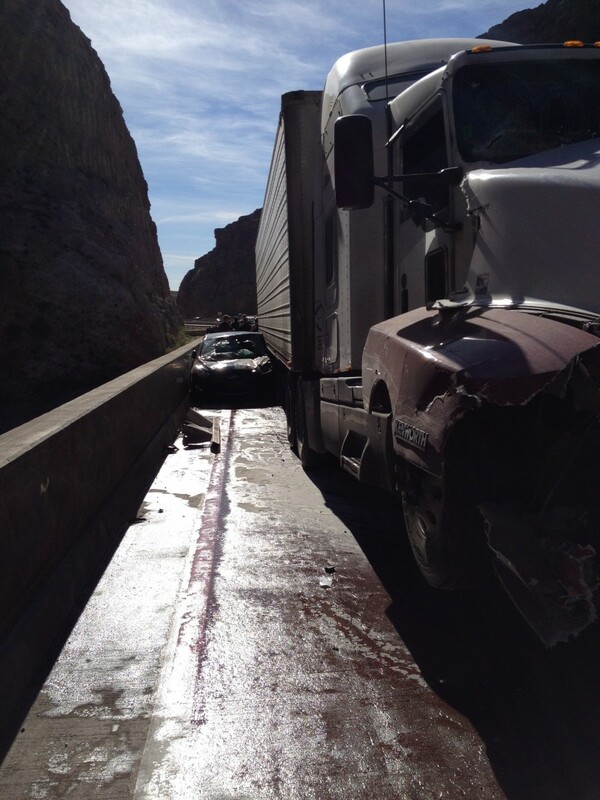 ST. GEORGE – Traffic backed up for several miles in both directions on Interstate 15 through the Virgin River Gorge Sunday afternoon after an accident involving two semitrailers and a passenger car resulted in a fire and two further collisions. 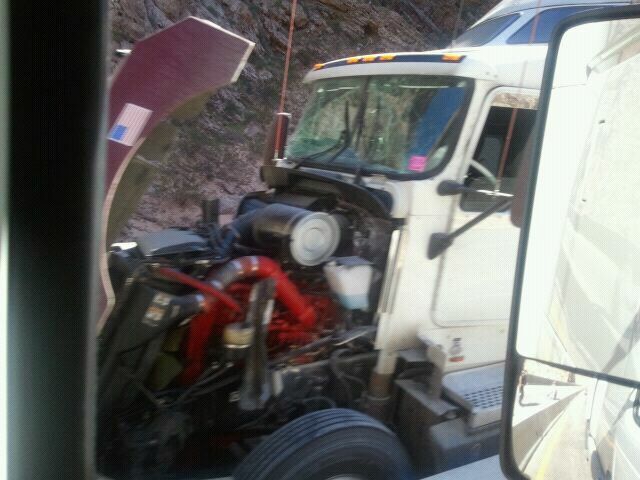 The first crash occurred at approximately 3:25 p.m. MST, Arizona Highway Patrol Sgt. John Bottoms said, near Arizona’s mile post 13 in a construction area located in the middle of Bridge 3 of I-15 of the Virgin River Gorge. Brandon Scott Grem, 24, from Spanish Fork, was traveling with passenger Kendyl Wyatt, 21, from Corona, Calif., in a black passenger car that he had just bought two days earlier, Bottoms said. As Grem was driving northbound through the Gorge between two semitrailers, he slowed to a near stop to avoid rear-ending a semitrailer driven by Lusio Yamez, of San Bernardino, Calif.
A second semi did not slow down, and was traveling too close to other vehicles on the road to make a safe stop, so the driver, Kevin Swenson from Belgrade, Minn., tried to avoid hitting Grem’s car by pulling up the left side of him. Swenson ended up hitting Grem’s car and wedging it in between his truck and the concrete barrier, while rear-ending Yamez’s semi. A passing motorist broke out the back window to pull both Grem and Wyatt out of the car, and then broke out the front window to turn the car off because the engine was running and revving really high. Both escaped serious injury, Bottoms said, ending up with only minor cuts and scrapes from flying glass. Swenson was cited for failure to control the speed of his vehicle to avoid a collision, Bottoms said, and no other citations were issued. The road was completely closed from 3:30-5:30 p.m. MST backing up traffic to about mile post 6 in Arizona, equating to about 7 miles of backup. All of the traffic was routed off on Old Highway 91 during that period of time. As a result of the collision and traffic backing up, two other collisions occurred. Both were noninjury collisions with only minor damage to those vehicles but did lead to one arrest. After the road was opened at 4:30 p.m., the residual backup traffic took another two hours to clear out until the road was completely free and moving again at approximately 7:15 p.m. MST. Arizona Department of Transportation began road construction in January on a $2.8 million project to upgrade the southbound bridge surfaces, repair girders and perform other work on Virgin River Bridges through the 29-mile stretch of I-15 through the Virgin River Gorge. Bottoms said AHP has only seen a couple of collisions since construction started and most of it is because drivers haven’t merged properly, then cut someone off resulting in a collision. Very surprised (but thankful) that there aren’t more accidents in the gorge, especially with all the construction going on. I know we’ve all seen the stupidity come out of people while driving through the gorge. It’s some of the worst driving I’ve ever seen. I can’t even begin to count all the near accidents and close calls I’ve seen because some idiot can’t wait a few more seconds and decides to cut off a semi, or the morons who weave in and out of the lanes without signaling and take the curves thinking they’re Earnhardt Jr. Thank heaven no one was badly hurt. I’m sure glad I wasn’t there, I don’t think I would ever go through the gorge again. i agree with you s. carter. and i hate to say it but the truckers that go through the gorge “regularly”, are actually quite hostile. they yell and scream at passing cars that they don’t know what they’re doing through the gorge at the construction zones. (because traffic slows down) they also treat everything like it doesn’t exist, which is why this happened. im glad nobody was seriously injured. Truckers need to get off their phones, stop texting, get on the radio. They give CDL to anyone. Bull ****, personally I’m tired of it, gives good truckers a bad reputation, idiots! What kind of an idiot squashes a car in the Gorge, maybe the grammar police. It’s called an accident ,there’s more car accidents then semi accidents . This article sounds like it was written by a middle schooler. Run in sentences?!? Does this “newspaper” even have an Editor? Robert I see your grammar is lacking as well. Could you please tell me what run in sentences are? Grammar police, go get a life both of you are lame. Excellent concise writing, thank you . I’m surprised there aren’t more accidents in the gorge generally. Add the construction piece, and it’s a recipe for disaster given the driving tendencies I see. It’s fortunate it wasn’t worse than it was. The driver of the car was only going 10 miles an hour and the trucker ran into him. 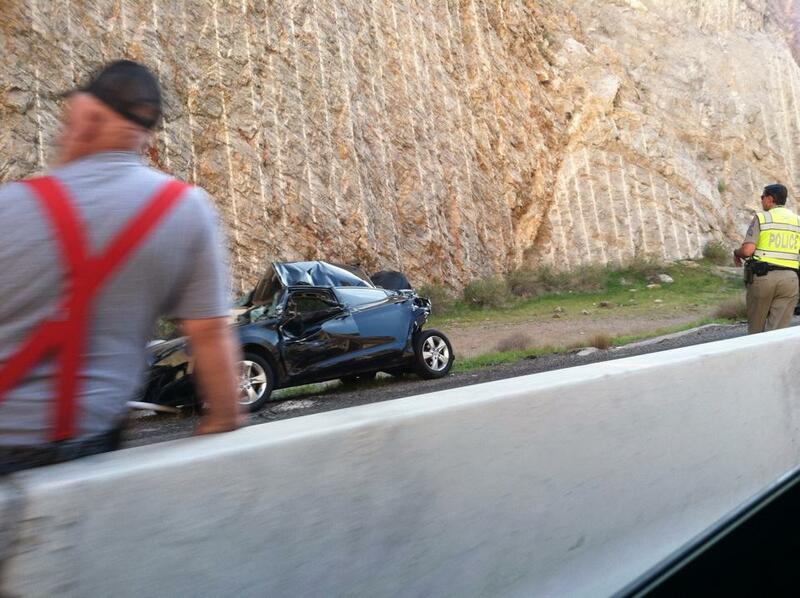 The driver of the car is from Orem and so is not a tourist. The owner of the car is from California and was the passenger. Please read the article before commenting on it. I was traveling through the gorge that day and people were driving very aggressive and for some reason Arizona didn’t have any troopers out until the wreck and now they’re only out from sunup to sundown. It’s funny how people will put themselves into check when they see an officer but these officers aren’t doing anything, they just sit there. I’ve seen people coming into the gorge in the 35 mph construction zone doing 80 + and the trooper will just look at them.